Global is reporting that "Edmonton homicide detectives are investigating after a man’s body was dug up from under a garage in north Edmonton on Friday. 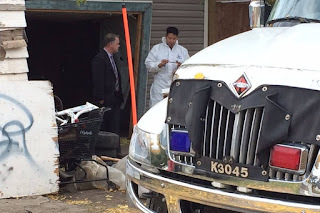 Police said they received information this past week that a body may have been buried in the floor of the residential garage near 118 Avenue and 96 Street. A forensic examination was carried out this past week at the garage of the home in the Alberta Avenue neighbourhood, which police said was known to them." The Edmonton Journal is reporting that "The property is registered to a numbered corporation owned by Gohar Tasneem. The company was also the registered owner of a property where 24-year-old Lena Steinhauer was killed on Feb. 9, 2015." He obviously had a passed connected to Organized Crime, but details are not being fully disclosed by RCMP!